^ "Mendelssohn's 200th Birthday," Performance Today, 3 February 2009. Hour 2, 36:00–42:00. ^ Icons of Europe report dated 7 February 2005, Chopin and Jenny Lind: New Research, shared with the Fryderyk Chopin Institute in Warsaw. ^ The New York Times, "A Lady's Morals a.k.a Jenny Lind" and Mordant Hall, "The Swedish Nightingale," The New York Times, 8 November 1930. Chorley, Henry F; Ernest Newman (ed.) (1926). Thirty Years' Musical Recollections. New York and London: Knopf. OCLC 347491. Elkins, Robert (1944). Queen's Hall 1893–1941. London: Ryder. OCLC 604598020. Jorgensen, Cecilia; Jens Jorgensen (2003). Chopin and The Swedish Nightingale. Brussels: Icons of Europe. ISBN 2-9600385-0-9. Ronald J. McNeill in Century Magazine "Notable Women: Jenny Lind"
Bulman, Joan (1956). Jenny Lind: a biography. London: Barrie. OCLC 252091695. Goldschmidt, Otto; Henry Scott Holland and W. S. Rockstro (eds) (1891). Jenny Lind the artist, 1820-1851. A memoir of Madame Jenny Lind Goldschmidt, her art-life and dramatic career. London: John Murray. OCLC 223031312. Kielty, Bernadine (1959). Jenny Lind Sang Here. Boston: Houghton Mifflin. OCLC 617750. Kyle, Elisabeth (1964). 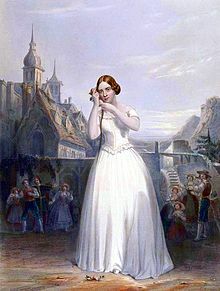 The Swedish Nightingale: Jenny Lind. New York: Holt Rinehart and Winston. OCLC 884670. Maude, Jenny M. C. (1926). The life of Jenny Lind, briefly told by her daughter, Mrs. Raymond Maude, O. B. E.. London: Cassell. OCLC 403731797. Wilson, James Grant; Fiske, John, eds. (1892). "Lind-Goldschmidt, Jenny" . Appletons' Cyclopædia of American Biography. New York: D. Appleton. Rines, George Edwin, ed. (1920). "Lind, Jenny" . Encyclopedia Americana.